BEFORE: Tarantino chain concludes with his most recent film, Inglourious Basterds. A minor update/clarification of the marathon rules. The point of this marathon is to watch a bunch of movies that, for whatever reason, I never got around to seeing. However I did not rule out films that I have seen before and I don’t intend to. There are many films that I’ve only seen many years or even fairly recently but don’t remember that well. 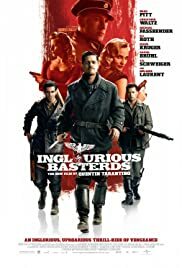 Inglourious Basterds is on of these films. I saw it shortly after it’s release in 2009 but I don’t remember it all that well. I recall that I liked it and the ending was quite memorable but the actual meat of the film escapes me. So while this marathon will mostly consist of films I’ve never seen before, every once and a while I’ll be taking the time to revisit a film I don’t remember that well or even a classic that I haven’t seen in years. But enough talk. Time for Nazis, Nazi hunters, and other World War II stuff. AFTER: When it comes to Tarantino films, Pulp Fiction has been my favorite for a while. It’s just the perfect mix of comedy, drama, acting, and production design. But after re-watching Inglourious Basterds, I really have to think about whether it is still my favorite. This film also has a perfect mix of all the elements that go into making a great film. Christoph Waltz’s performance as Col. Hans Landa would be as he says in the film, “That’s a Bingo.” He portrays a Nazi that is smart and cunning, thinking about his actions before he acts as opposed to all the other blood-thirsty savages. Tarantino has said that Waltz “gave me my movie” and I think that is exactly right. But in addition to Waltz you also have equally good performances by Brad Pitt as Lt. Aldo Raine and Eli Roth as Donny “Bear Jew” Donowitz, two members of an elite team of Nazi hunters. Pitt especially is responsible for some of the funniest scenes in the film. It’s just so amusing to see Pitt, whose character has a strong Southern accent, try and pass himself off as an Italian. Besides the terrific acting, Inglourious Basterds is full of wonderful direction by Tarantino. He just knows how to keep a scene exciting even though it may run on forever. A great example is the opening scene, or Chapter 1. This scene takes place solely in and around a dairy farmer’s remote house in the countryside of France. From the first to the last shot, you’re drawn in by the wonderful visuals of the country, the beautifully written exchange between Col. Landa and Monsieur Lapadite (Denis Menochet), and then the gripping conclusion as Shosanna (Mélanie Laurent) escapes her hideout. I immediately got lost in the film and had no sense of time until I checked the timecode afterwards and noticed twenty minutes had already passed. It’s a great war film, a great fictional story, and one of Tarantino’s best so far.